The 1950s brought continued growth and a different way of building Safeways. For 25 years they used the 'cookie cutter' method of identical stores for every situation but in the 1950s they loosened the reigns. Exterior finishes and some design elements were varied to suit the lot and fit in with the neighbourhood around them, though the interior layout of the stores remained identical. 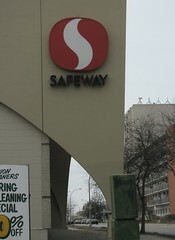 A design feature that appeared at many of the early 1950s stores was the "big fin", (my term, not theirs), bearing the Safeway name, as seen above. In the late 1950s and into the 1960s competing chains caught up to the trend of larger stores. Continued suburban expansion and wider, faster traffic routes meant that 'curb appeal' became an important feature. 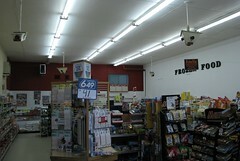 To see some of the myriad of designs used in the U.S. check out the Safeway posts at Pleasant Family Shopping. Winnipeg, though, had a more limited selection. (Sept 24 1959) Featured an underground car park ! Likely the most-loved style of Safeway throughout North America was, and is, the 'Marina Style', named for the prototype store on Marina Boulevard in San Fransisco. The Marina Style, or 'theme', as there were variations on the original design, was distinctive for its wavy roofline, full glass front and stone side wings. The Ellice Avenue and Wall Street store, their 32nd built in Winnipeg, was recently closed. There is a video of the store in it's final days and being de-commissioned on Youtube. The store's original facade was demolished the following year. 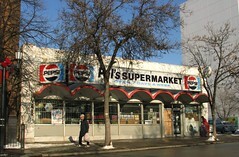 This location had a unique tie-in to a local gas stations chain and was a pioneer, in Winnipeg at least, for tying grocery sales to savings on fuel purchases. Dominion Motors ran two gas stations in the city, one at their Dominion Motors sales lot and one at the Dominion Centre on Marion. They opened a third in the parking lot of the Ellice and Wall Safeway in 1965. 'Dominion', however, was also the name of a Canadian rival supermarket chain so a new name had to be found and Dominion Gas Bars were rechristened DOMO. As you can see in the above photo from the DOMO website they even had a little architectural fun mimicking the Marina style roof of the neighbouring store. Not all Safeway stores were custom builds. The former Tivoli Theatre (now a Food Fare) at Maryland and Westminster was converted into a Safeway in 1959. 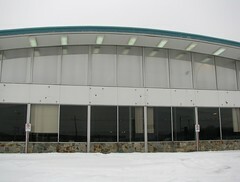 The Marina-style's era was short lived and by the mid 60s a new style emerged boasting 28,000 square feet of space. The following stores were also built in the late 1960s but there were no photos in the grand opening ads so it's unknown what style they were. 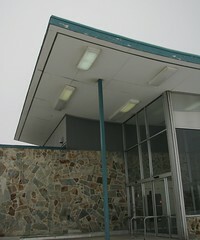 In the 1970s there was less emphasis on the stand-alone store and more on strip mall and shopping centre developments. This effectively ended the era of architecturally unique Safeways. The only original, ca.1929, Safeway still used as a grocery store is now a Pal's Supermarket on St. Matthews at Beverley. It survived into the 50's under the company banner then it became a Payfair. The only 1940s style store still in operation is also a Pal's on Broadway near Young Street. 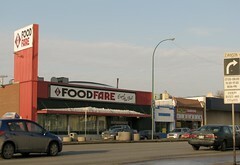 On Portage between Burnell and Arlington you can see a 1931 and 1951 era Safeway almost side by side. 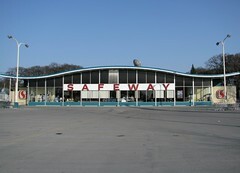 In 1985 the 1950s era safeway closed and a former Safeway Manager, Harry Halbesma, took it over to create Harry's Foods. 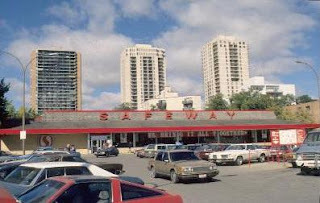 The only Marina Styl;e Safeway left in Winnipeg is at 1441 Main Street. On June 12, 2013 it was announced that Sobey's had bought all of Canada Safeway's assets, including over 200 retial stores in Western Canada. Safeway's 84 year run as come to an end. Thanks, I feel a bit geeky myself getting so deep into it ! Just a note, the store at 1031 Autumnwood Drive was not demolished. It is still there, it has been redeveloped into a sort of stripmall. there is a hairdresser, a homebuilder's office and until recently a Service Canada office. The original Marina style front facade was covered up with a new false parapet, but from the rear the curving roof is still clearly visible. I remember going to this location in the early 70's with the turntable checkouts before the new store on Fermor in Southdale. Ah, thanks. I will make that change. The same thing, I believe, was done with the Safeway at Bronx and Henderson. The facade was altered to make it look like a shoebox but the store is still original. There was a Ranch style one at Osborne - it was used as the temporary store when they were rebuilding behind it. Was used as a MLCC at one time too. Good post, excellent research. I really enjoyed reading this. Great - thanks for that. I will make the correction ! The PAL's Supermarket on Henderson (before Johnson intersect) was also once a Safeway. Something you may want to add. Thanks ! Pal's was among the first built so it's in the previous section dealing with the 20s - 50s. 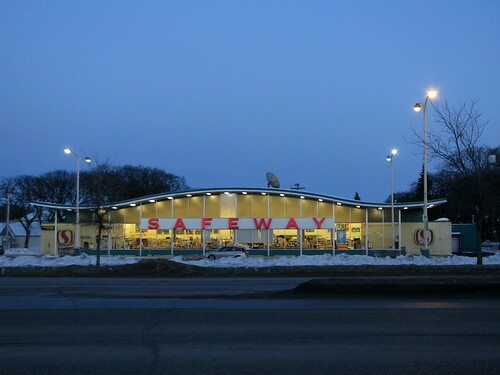 Hi just wanted you to know the Safeway at Pembina and Mcgillivray is not demolished - just re-modelled! Corydon and Lanark store was originally closer to Corydon. Rebuilt farther back in the late 60's I believe. They had a lunch counter. The current building is where Bernsteins' is located. The original Safeway at Pembina at McGillvray in now the current front part if the Holiday Inn south...it is their banquet facilities I think. A quick look and you can tell it was a Safeway before building the new one across the street. The Nairn and Panet store is completely different than the Regent and Lagimodiere store. The N/W Nairn and Panet store became a Canadian Tire, then Ironworkers Gym, and finally a Canada Post Distribution Center. When Safeway closed the Nairn Store, they ended up moving to the S/E corner of Regent and Lagimodiere and were the cornerstone store for new Shopping Center along with Woolco. Great site, alot of information. Maybe you can add some original Safeway products once sold in the stores, like the stack of chocolate cookies, or the excellent Corned Beef, which was unique in it's time because it was sliced very thin and was more like roast beef rather than today's corned beef. 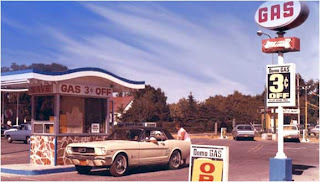 I remember all the huge seventies cars parked diagonally in front of the Mountain Ave. store. Now, even with smaller cars, the parking lot looks tiny. You indicated a number of stores being demolished when in fact they were never demolished, but remodeled, expanded or repurposed. 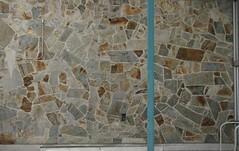 The location at Sargent and Maryland was one such location which was remodeled and expanded in the early eighties. Logan and Keewatin was simply shutdown and eventually remodeled as a church. 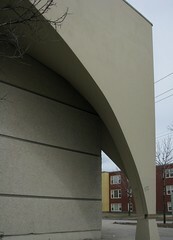 Ellice and Wall ( you incorrectly indicated Sargent and Wall ) was also closed, but never demolished. It was repurposed and remodeled. Pretty sure the Safeway at Portage and Ferry Road was not demolished and is now Family Foods. Certainly looks like an old Safeway from the inside. Also. notice the Domo out front.